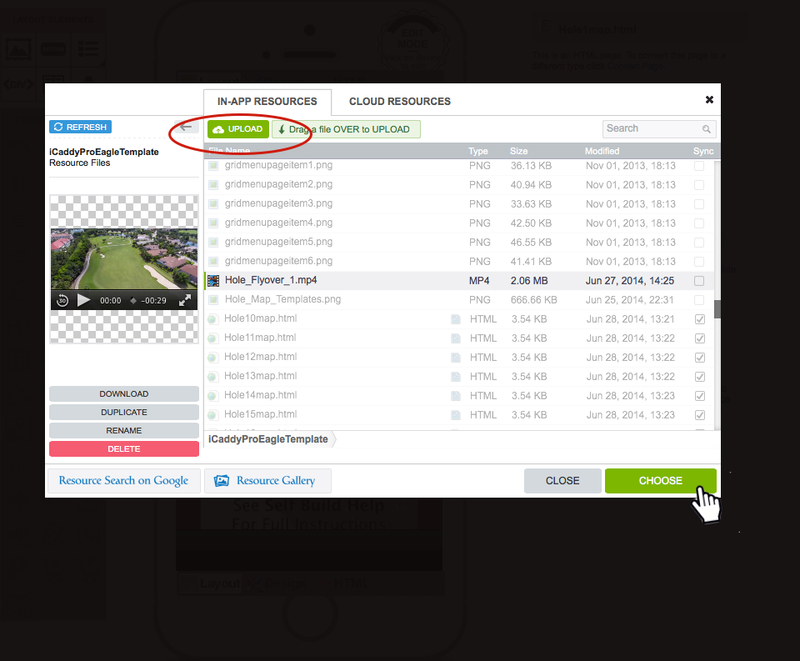 Incorporating video files into your App is optional. Videos are normally used to display 'Hole Flyover' footage, however Club's can use the video feature in other ways - such as incorporating a pre-recorded promotional video as an advertising option, or providing tips by the Club-Pro. 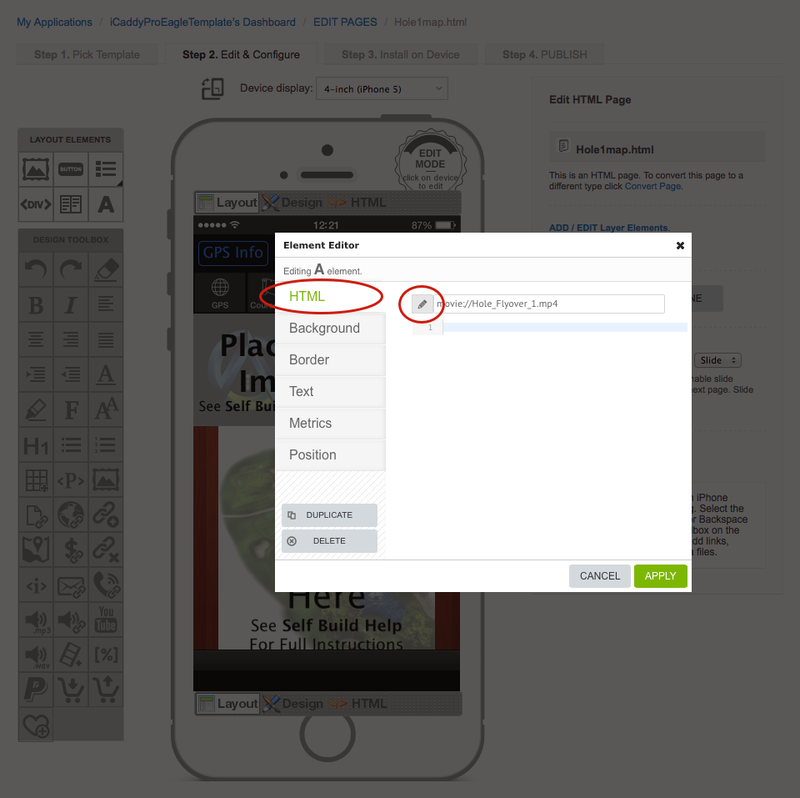 The following tutorial shows you how to link a video file to a button in your App. The images above show examples of pages that contain video links. The image on the left (above) shows an example of a 'Hole Map' page on the iCaddy HD (Eagle) template. 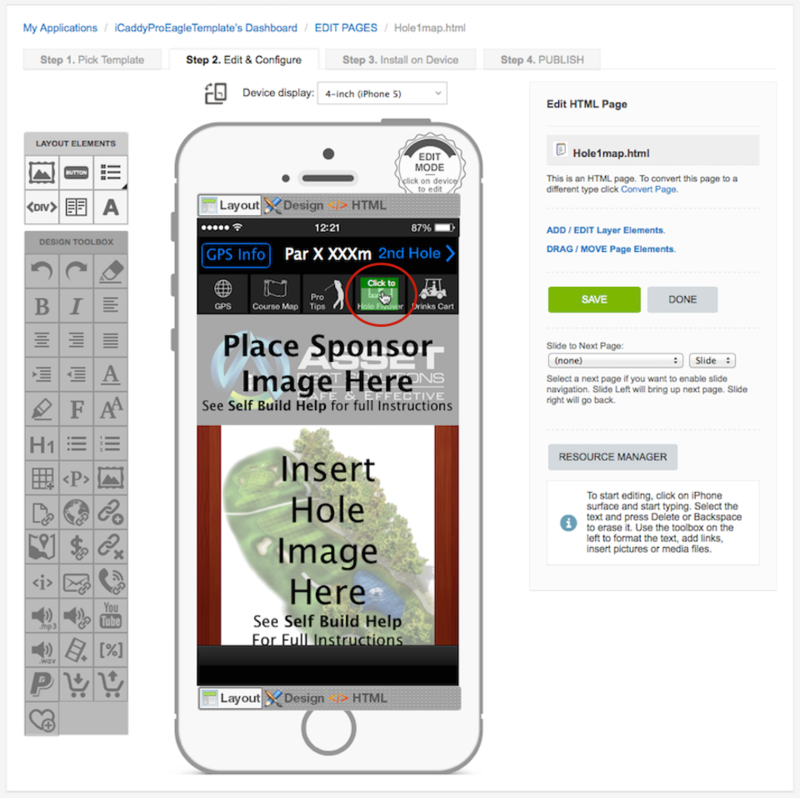 The image on the right (above) shows a 'Hole Map' page button on the iCaddy Pro (Eagle) template. 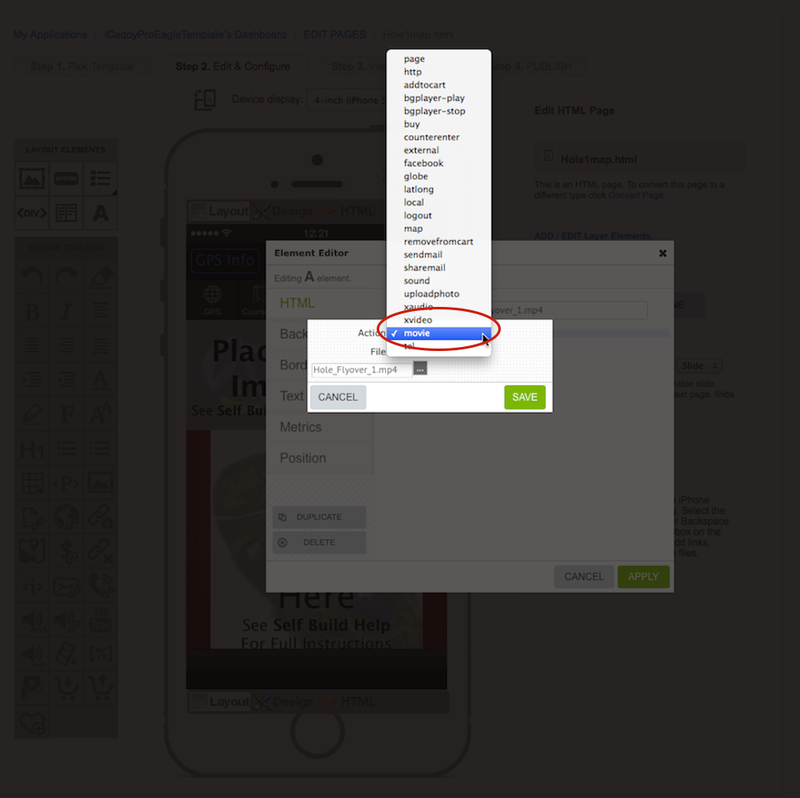 On the relevant page, select 'Layout' mode (left option at the top of the 'handset display') as shown above. 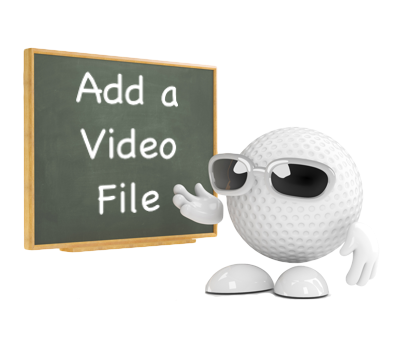 Hover your cursor over the button (element) that you want to link the video file to (e.g. either the video icon at the top left of the iCaddy HD (Eagle) hole map page, or the 'Hole Flyover' button at the top of the iCaddy Pro (Eagle) hole map page). Click on the highlighted element to edit it. The Element Editor will open (as shown below). Click on the 'Action' field to open the 'Action' drop-down list (as shown above). Select the 'movie' option (for iOS devices), or the 'xvideo' option (for Android devices), depending on the target platform of the App being edited. Be sure to check that the tick is displayed next to your selection. After selecting 'movie' or 'xvideo' as described in Step 4, click on the grey box in the 'File' field (as shown above). The 'Resource Manager' will open (as shown in Step 6 below). Upload the video file you wish to insert into your App. 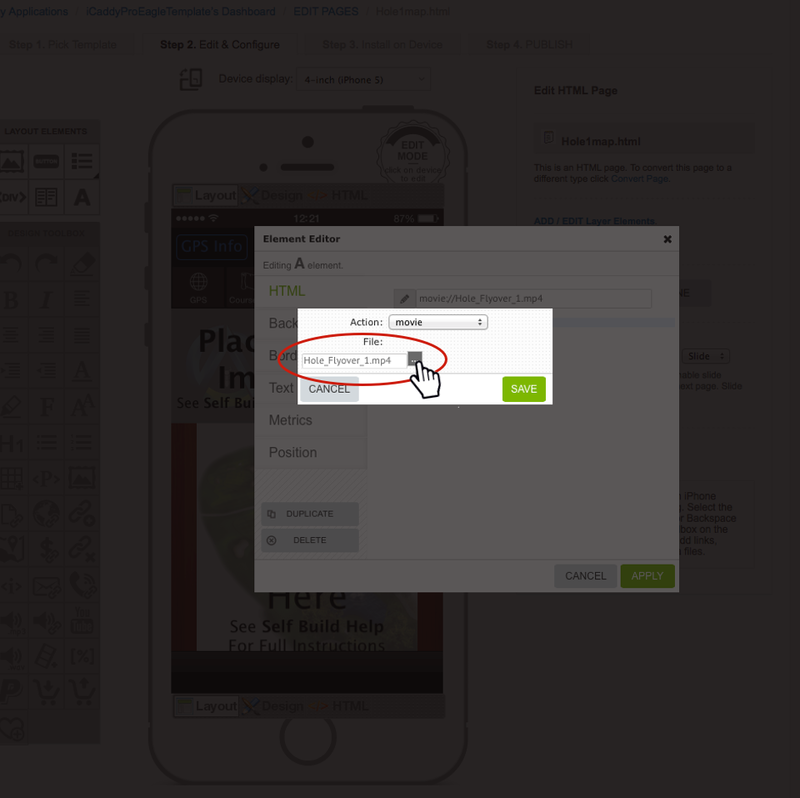 For further information on how to upload a file, please go to How to Add a File to your App's 'Resources'. Note: The functionality of the video file can be verified by using the iCaddy Apps Previewer on your target device (e.g. iPhone or Android). Refer to How to Download the iCaddy Apps Previewer and How to View Your App on the iCaddy Apps Previewer, for further information on how to download and use the iCaddy Previewer App.